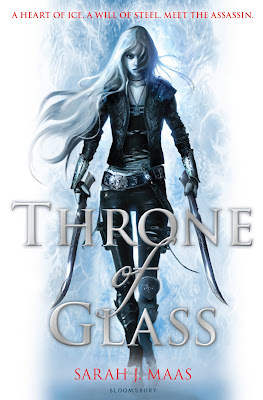 Throne of Glass cover art – can you see why I had to have this? Throne of Glass also had some pretty damn cool cover art. Icy woman, walking determinedly barefoot toward the reader, two massive swords held at her sides? She was insistent that I take her home with me. So I did. For some reason, I thought that Throne of Glass would be trashy. I even felt appropriately guilty about buying it, knowing I should be trying to broaden my reading tastes. But you know what? It was awesome, and I was not even ashamed of immediately pre-ordering its sequel (which I now have in my possession!). Throne of Glass revolves around Celaena, formerly known as Ardalan’s Assassin. A highly capable killer, Celaena was caught and thrown into the salt mines of Endovier to labour away her debt to society. And then one day, the Crown Prince Dorian shows up at Endovier with the Captain of the Guard, Chaol. They offer something she thought was long ago lost to her – a chance for her freedom. Of course, it comes with a condition: Celaena must win a tournament, earning her the title of the King’s Assassin. She agrees, and is ensconced in life in the palace. She makes new connections, both personal and political, and finds herself gradually falling for the Prince Dorian while Chaol looks warily on. She soon emerges as one of the frontrunners of the tournament, and things seem to be going relatively well. That is, until the other competitors are horribly killed. Celaena, pragmatically single-minded, tries to ignore it and simply focus on her own goals. Unfortunately for her, though, the powers that be have other ideas. The best thing about this fun fantasy is, without doubt, Celaena Sardothien. Celaena is a refreshing change from fantasy’s usual stock of worldly women. She is cavalier, flippant and sarcastic in conversation, giving the impression that she is little more than an air-headed adolescent. But she’s also dangerously intelligent, and unexpectedly observant. She’s strong without being callousShe’s flirty without being vapid. She’s a tough physical opponent, and she never even thinks twice about the fact that her foes are burly males. She’s fiercely beautiful and doesn’t pretend she’s not. She is confident in herself and her abilities, and she is also realistic about her flaws. I can’t decide if I want to be her, or if I want to be her best friend. 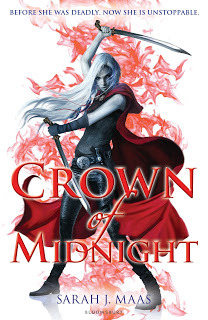 Crown of Midnight – with cover art that is just as awesome as the first. There is a romantic subplot, but I liked that it wasn’t too OTT. Celaena is one point of the inevitable love triangle, but all in all, it wasn’t too cliché. I appreciated that it was a slow burn, compared to some, and that there’s no obvious front-runner. Without an obvious preference, it means that the romantic element is exciting to read, rather than simply painful. Prince Dorian was initially presented as the shiny, pretty thing who Celeana is happy to mess around with, but it soon becomes clear that he has developed serious feelings for her. Chaol, on the other hand, is withdrawn and brooding – he is the darker Angel to Dorian’s Riley, for those who appreciate the occasional Buffy reference. Overall, Throne of Glass wasn’t earth-shatteringly amazing, but it was a really fun read. I wasn’t entirely addicted to it, but I was looking forward to picking it up on my breaks at work. It’s a little bit like Eragon, in that it’s nothing new or particularly special, but it’s quite well done. I would have liked a little more character development and a tad more back story, but I’m hoping that this will emerge as the rest of the trilogy is published. I picked up my copy of Crown of Midnight this week, and I’m looking forward to hanging out with Celaena a little bit more! What do you guys think? Will you be giving this one a go? You are currently reading Throne of Glass: A Killer Read (Pun Intended) at The Novelettes Book Reviews.